The Falcons remain perfect as they get set for their week 10 game at New Orleans, and with the way the Saints have played as of late, many feel this will be the week the Falcons fall. I know, why not? The Saints are finally playing up to the level many are use to – throwing the ball, getting turnovers, and scoring TD’s. Won’t be so easy vs the Falcons, who remain perfect for one simple reason. They don’t make many mistakes. They are not full of penalties, turnovers, or a ton of mental mistakes. When they take the field on Sundays, they have a mission in front of them, and right now, they are doing it as well as any team recently. At 8-0, Atlanta is running away with the NFC South, ahead of second-place Tampa Bay by four games – the largest division lead in the league. At 3-5, the Saints are five games back, and need this game if they are going to make a serious run in the South. The Falcons are just the 15th team since the NFL went to a 16-game schedule in 1978 to start 8-0, yet they’re still receiving criticism. They haven’t had to face the stiffest competition, having played teams with a combined winning percentage of .369, and they’ve occasionally struggled. The Falcons overcame the Cowboys last week on Sunday night, and again while it wasn’t pretty, they rallied and got the job done to stay unbeaten. “I think at the end of the day it’s a league that’s based on wins and losses and (Sunday) was a solid effort by this team and we did what we needed to do to come out with a win,” said Matt Ryan, who threw for 342 yards but had his streak of consecutive games with a touchdown pass end at 22. Drew Brees has the NFL record in that category and extended it to 51 games with a pair of TD throws in Monday’s 28-13 win over Philadelphia. It was the Saints’ third win in four games following an 0-4 start. “There are defining moments throughout a season,” said Brees, among the league leaders with 2,549 passing yards and 22 touchdowns. “Big plays, big wins, that kind of bring you together and let you see a vision of what you can be, what you can accomplish. The running game has been an area of concern for New Orleans, which is averaging 31.3 points in its victories, but Chris Ivory, Pierre Thomas and Mark Ingram combined for 136 yards on the ground against the Eagles. The Saints came into the game ranked last in the NFL in rushing with an average of 72.6 yards. If New Orleans can build on that performance against a Falcons team yielding 127.5 rushing yards per game – second-most in the NFC behind the league-worst Saints (176.5) – it should open up things for Brees, not that he needs much help. 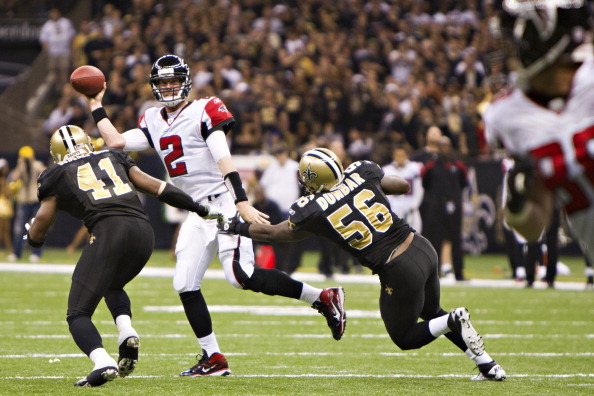 The six-time Pro Bowler has usually been just fine in this series, going 10-2 against the Falcons since joining the Saints, averaging 303.3 passing yards with 26 touchdowns and 11 interceptions. He’ll be facing a defense that could be closer to full strength, with linebacker Sean Weatherspoon and tackle Peria Jerry possibly returning. Weatherspoon, who has a team-high 52 tackles, missed last week’s game with a sprained right ankle. Jerry left in the first half with a knee injury. Brees has never faced a defense like the Falcons this season, and if he thinks he’s going to throw the ball all over the field with ease – it won’t happen. Look for Ryan and the Falcons to score plenty, and to walk away from New Orleans still perfect. Who Wins the Huge Week 10 Game Between the Falcons and Saints? Yes, Brees and Jimmy G and others were very over-whelmed against the “Never faced a D like the Falcons this season” D!